The Bay Area contingency of the Chain Gang is pretty active, but I’d been too busy with wedding/honeymoon stuff to take part. Fortunately, yesterday’s calendar was wide open and I finally made it to a ride. I don’t have many photos yet since I thought it might be nice to drop my camera at a gas station and now it won’t take pictures. Grr. I bought a disposable camera at said gas station, but haven’t gotten the pics back yet. Anyhoo, we met up at the Los Gatos Cafe in the morning. I’m embarrassed that I didn’t catch everyone’s “real” names, but it was myself, Darren, MrBShields, cyath, and SenorPeligro (his name is Andy, I did catch that). 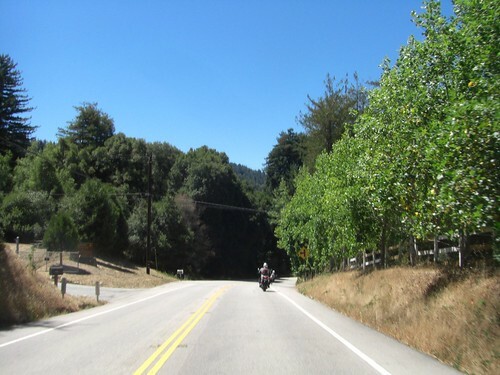 We hopped on 17 for a short bit and had a very nice ride down Old Santa Cruz Highway to Summit to San Jose-Soquel Road. And that’s pretty much all the photos I have for now. Doh. 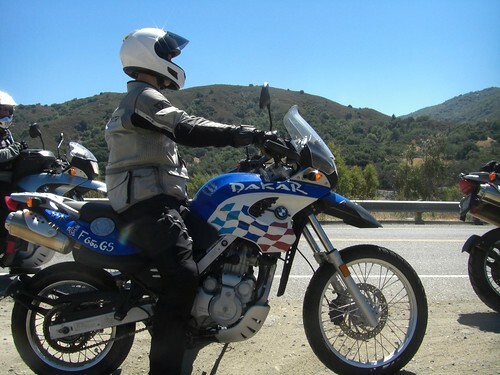 Anyway, we took Highway 1 south down to Big Sur, which was entertaining because it’s MotoGP weekend. There were many, many, many bikes and many, many, many cops….oftentimes together. 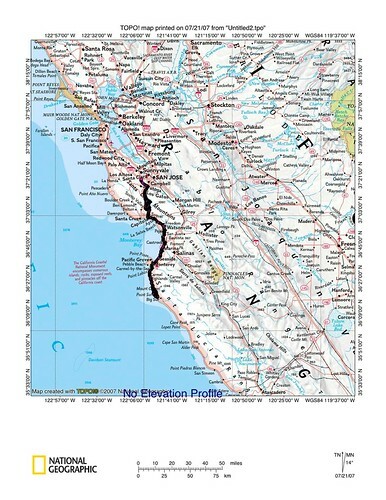 So we took a leisurely pace down through Monterey and along the coast. We aired down at the southern end of Old Coast Road, down to about 20/22 psi for front/rear, which is something I never remember to do. I’m not honestly sure whether it made a difference, but hey, OK. The road was wonderful. I was a little nervous on the initial rocky section but my confidence grew and I kept up a good pace (for me, at least) for the 10 miles. It was a gorgeous day — not too hot — but very windy out in the open hills, which made for some interesting tight switchbacks. You’d be going up a steep rocky hill, ready to make an off-camber uphill hairpin, and BAM, the wind would hit you crossways like a slap. Eek! The drop moved the handguard in on the handlebar a bit until it was pressing on the brake, so I busted out the tools and the “I heart Manatees” hat and got to work. I promised the guys I’d try to drop the bike in the shade next time but, fortunately, that was the only gravity incident. We stopped in Soquel on the way home for burgers and milkshakes. I ate my milkshake first and then had no room in my tummy for burger. Oops. Milkshake for dinner it is, then. 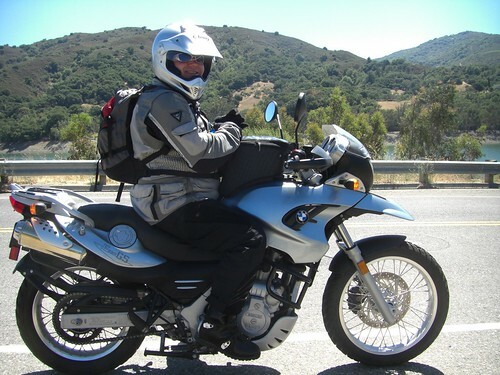 It was a great day and a lot of fun to ride with other F650GSs (and an R1200GS) and meet new people. Plus, off-roading fun. Yay! Looks like an awesome ride! 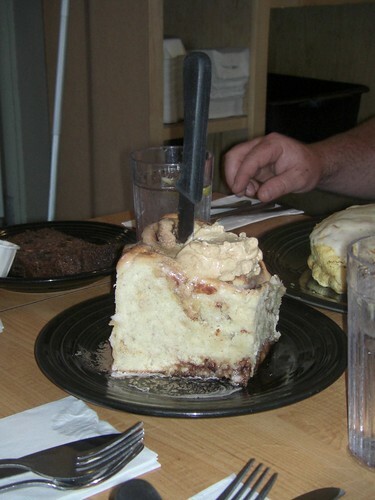 Those cinnamon rolls/buns are HUGE. Making me hungry just looking at it. I just noticed the Wolfman tank-bag too. Looks like it fits perfect. 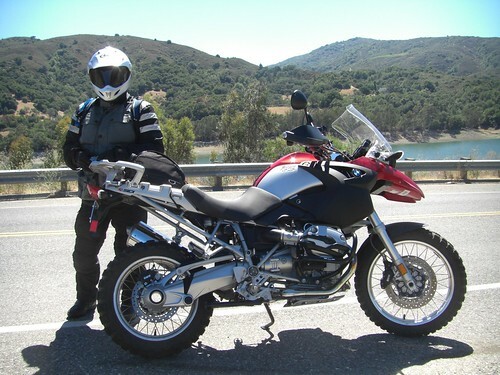 Wish I’d have known you were coming down on the GS. 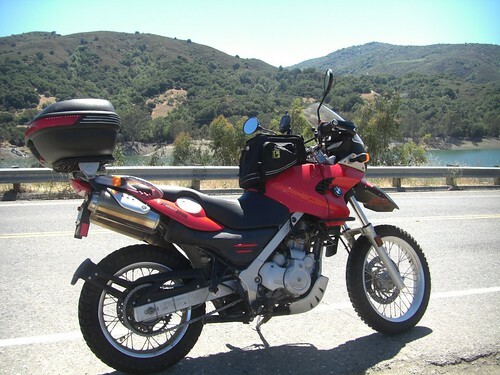 A weird little fact, the way into Laguna for motorcyclists is across old Fort Ord. Since they don’t check tickets until you are at the gate itself, that leaves all that open space, well, open. They tend to have people stationed at the side roads- so I’ve often mused about the possibility taking a dirt or dual sport in there. I imagine on race weekend the only thing they’d do if you get caught is direct you back to the main road. All the police are busy with speed traps. What a Nice bike. You’ve reached my dream. congratulations and enjoy it.